As you may know, we are having a Shawls, Wraps and Scarves KnitAlong. I had planned on making the Cream& Sugar Wrap in Vail. But something wasn’t quite right for me when I started. I really like the pattern and I love the yarn, but I got about 3 inches into the wrap and it just wasn’t speaking to me. So I decided that I wanted to do something a little different. I knew I wanted a lightweight shawl (although I tend to wear them more like loose oversized scarves than shawls), and something that was an intuitive pattern. I have had my eye on the Eyelet-Swirl Stole for a while now and thought it would be a good choice. I dug through my stash to find some Silky Alpaca Lace to swatch with. In the past I have shied away from lace weight yarn, feeling it's too small to work with. But I decided to give it a try anyway. I happen to have a lace needle in the correct size in my needle collection and cast on for a swatch. Wow! Working with lace yarn with a pointy tip, even with mostly stockinette stitch, makes a HUGE difference. Yesterday during lunch I cast on for my Eyelet-Swirl Stolein the Beach Glass color of Silky Alpaca lace and I couldn't be happier with my choice. I see this future FO being something that I can wear with everything – sweaters, cardigans, tees and jeans, under my coat in the fall and as a lightweight layer later in the spring (when a coat is too much, but you can't quite get away without an extra layer in the morning). I really love the fact that this knit-along has so many options. If you are looking for a layering piece for the summer, you can choose one of the wraps and make it in a lighter weight yarn. 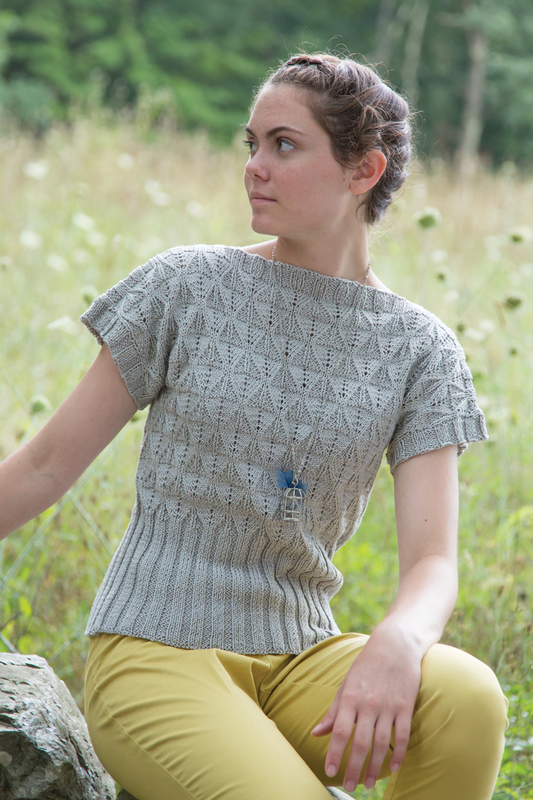 Or maybe you want to get a jump start on your holiday knitting (or finally start that piece that you gave an IOU for this past holiday season). There are 60 projects in the book to choose from and you can use any CEY yarn. It’s not too late to join us. You can read all the rules here and follow along in our Ravelry Group here. 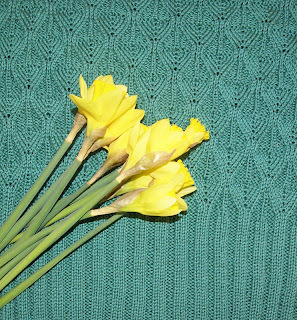 On one of my first days in the office at Classic Elite Yarns, I was given a sneak peek into the spring line. We weren't ready to introduce it to the world yet, but it was almost ready to show to yarns stores. There were so many things that I couldn't wait to put into my queue. One of which was Rocky Pond. One of the women in our office was going to California in February and wanted to wear something hand knit. 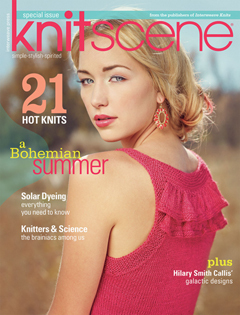 She wanted something that was simple, not too boring to knit, and only about two weeks work from start to finish. Rocky Pond was a perfect choice! The lace pattern in the top is intuitive, and can be easily memorized, eliminating the need to look at a chart every few stitches. 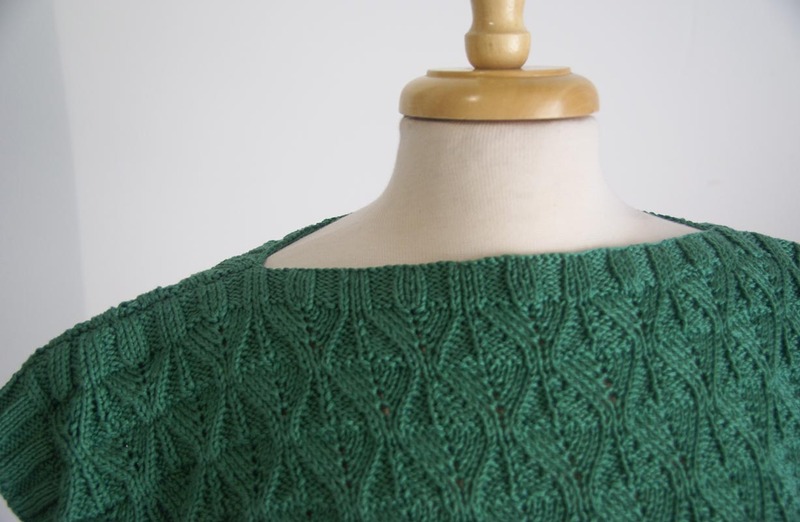 Meg used Provence, a 100% Mercerized Cotton in a DK weight, in the color of the year – Emerald (the official Provence color name is Laurel). I love the boat neck on this top, a flattering look for most women. Knit in two pieces with minimal finishing, it was a quick knit for Meg. She managed to finish it in just under her deadline (I understand that she may have been weaving in ends on the plane and blocking in the hotel room, but she finished it before her event – which is all that really matters). 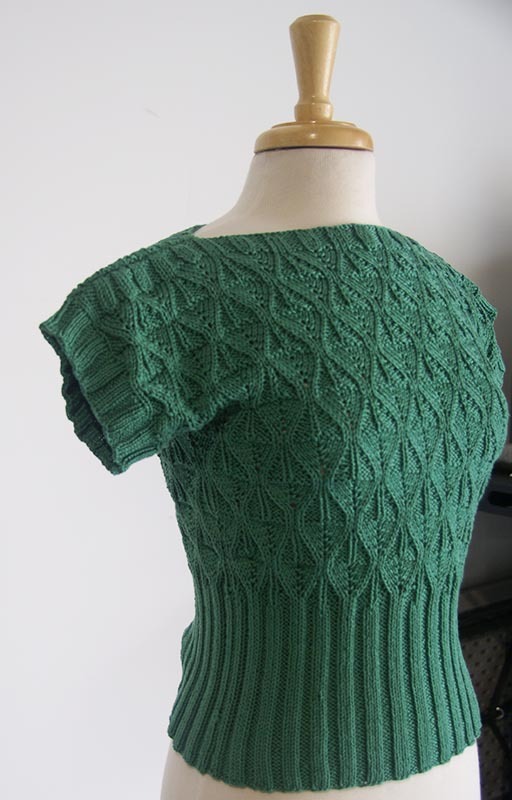 Now that spring is here – and hopefully to stay (fingers crossed) – I suspect that I'll be seeing this pretty top around the office quite a bit. I have plans for my own Rocky Pond, but I'm planning on using Soft Linen. There is a lovely shade of green called New Fern that I can’t wait to cast on. I have a few things in my queue that I need to work on first (including my Sugar and Cream Lace Wrap for the Shawls,Wraps and Scarves Knit-Along that we will be starting shortly. ), but I'm not sure if I can wait. Are you planning on making a Rocky Pond top – or have you finished one already? We would love to see it! 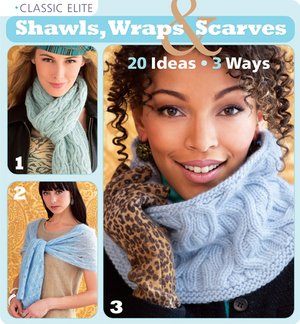 We are so excited to announce that we are going to be doing a knit-along from the Shawls, Wraps & Scarves book. Item must be made from CEY yarn and from the Shawls, Wraps & Scarves book. Cast on date for knit-a-long is April 15, bind off date is June 15. You may do a gauge swatch and any other prep work (i.e. winding your yarn, getting copies of your charts, etc.) prior to the cast on date. To be considered for the knit-a-long, your project must be listed on Ravelry with the tag SWSKAL. You may enter your project on Ravelry prior to April 15, but please no casting on until then (I know it will be difficult). You must upload at least one in-progress photos and a FO photo to be eligible for the prize. By entering the knit-a-long, you give permission to Classic Elite Yarns to use your photos, first name and Ravelry project links on their social media sites (Ravelry, Facebook, Twitter and Pinterest). There will be 2 categories to enter – Shawl/Wrap (over 600 yards) and Scarf/Cowl (0-600 yards). Prizes will be enough yarn (current CEY) to make another project of your choosing from the Shawls, Wraps & Scarves book in the same category you entered. There are so many great pieces from Shawls, Wraps &Scarves, the hardest part of this knit-a-long might just be choosing your project. It was a difficult decision for me, but I have settled on making the Cream & Sugar Lace Wrap (of course, I am not eligible to win, but I thought it would be fun to knit-a-long with you guys). I decided to use Vail in Parchment. I am sure this will become an instant classic and something that I reach for time and time again.